Distribution. Seedcorn maggot is found in temperate areas all over the world. It was first described in Germany, but had attained North America by the mid-1800s, and like so many other invasive pests, gradually spread westward. It is now reported from throughout the United States, including Alaska and Hawaii. Seedcorn maggot is common in southern Canada, and is also reported from some far northern locations in Canada, including the Yukon and Northwest Territories. Seedcorn maggot is very difficult to distinguish from turnip maggot, Delia floralis (Fallén), so some reports of occurrence and damage are suspect. Host Plants. A wide variety of plants are reported to be attacked. Among vegetables reported injured are artichoke, beet, Brussels sprouts, cabbage, cantaloupe, carrot, cauliflower, corn, cucumber, garlic, kale, lettuce, lima bean, mustard, onion, pea, potato, pumpkin, rhubarb, rutabaga, sea kale, snap bean, spinach, squash, sweet potato, tomato, and turnip. Other crops such as alfalfa, cotton, strawberry, tobacco, and wheat also are damaged. Seedcorn maggot has been reported to feed on grasshopper eggs. Seedcorn maggot attacks seeds and seedlings, but there is some doubt about its status as a primary pest. It is often regarded as saprophagous, associated with plants that have already been damaged by other insects or plant disease (Brooks, 1951; Beirne, 1971). Natural Enemies. The natural enemies of seed-corn maggot are largely the same as those attacking onion maggot, Delia antiqua (Meigen). 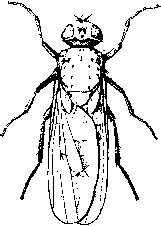 Among the most important are the parasitoids Aleochara bilineata (Gyl-lenhal) (Coleoptera: Staphylinidae) and Aphaereta pal-lipes (Say) (Hymenoptera: Braconidae) (Tomlin et al., 1985). General predators such as ants and spiders also act on seedcorn maggot. Berisford and Tsao (1974) described an epizootic of the fungus Entomophthora muscae (Entomophthoraceae) in seedcorn maggot. Additional information on these natural enemies is found in the section on onion maggot, Delia antiqua (Meigen). Life Cycle and Description. A complete life cycle requires from 15 to 77 days, but during most of the year 16 to 21 days is adequate. However, owing to aestivation of larvae in the summer and diapause of pupae in the winter, there usually are only 2-4 generations annually. The exact number of generations is often uncertain owing to asynchronous emergence, generations that are divided into diapausing and non-diapausing populations, and variable weather. Based on thermal accumulations and flight patterns, there seem to be four generations per year in Wisconsin (Strong and Apple, 1958); this is also reported from Ontario (Beirne, 1971) and England (Miles, 1955a). Throne and Eckenrode (1985) reported four flights of adults in New York—one each in May, June, July, and August. In New York, not all overwintering flies emerged in May, so the June population consisted of both overwintering flies and progeny of the May adults. Not surprisingly, the June population tends to be both large and damaging. The number of generations per year was estimated by Reid (1940) to be three in South Carolina. No diapause was observed in South Carolina, with the insects active throughout most of the year, especially in the cooler periods. In Iowa, only two generations were observed (Funderburk et al., 1984a), and Higley and Pedigo (1984) reported a summer aestivation that progressed into diapause. The threshold temperature for egg-adult development is estimated at 3.9°C (Sanborn et al., 1982a), but unlike some other Delia spp., it has proved difficult to predict accurately the development of seedcorn maggot from temperature accumulations. The eggs are elongate and ovoid, with one end tapering to a blunt point and the other more bluntly rounded. The egg is slightly curved, with one side being decidedly convex and the opposite being slightly concave. The pearly-white eggs measure about 0.92 mm long (range 0.90-0.95 mm) and 0.3 mm wide. The eggs are usually placed at the soil surface, singly or in a cluster of up to 10. Oviposition occurs readily at 10-27°C. Favorite oviposition sites are sprouting or decaying seeds, plant material, and organic fertilizer such as fish meal or cottonseed meal. Moist, freshly turned soil is quite favorable for egg laying. Females avoid both dry and very moist soil. Duration of the egg stage is a function of temperature. It may hatch in just one day when held at 28°C, but at a more spring-like temperature of 15° C, egg hatch requires 2-3 days, and at cool temperatures of 5-7° C about 7-9 days are required. Larvae dig down upon hatching, often burrowing to a depth of 6-8 cm to locate suitable food. Seedcorn maggot larva, posterior view showing caudal spiracles. may develop at rather low temperatures of 4-7° C, but optimal growth occurs at 21-23°C. Larval development time is 20-30 days at temperature of about 10° C, but 7-12 days under more optimal temperature of 21-30°C. At about 14-17°C, the duration of the first instar is 1-3 days, second is 3-5 days, and third is 5-16 days. The anterior spiracles, a character with some diagnostic value, bears 5-8 lobes. This character is particularly useful for distinguishing seedcorn maggot from onion maggot; the spiracles of the latter bear about 12 lobes. The oval puparium is light reddish-brown initially, but becomes quite dark before emergence of the adult. It measures about 4-5 mm long and 1.5 mm wide. Following a prepupal period of about two days pupation occurs in the soil, often at the site of feeding. When larvae have burrowed into their food, as occurs with potato seed pieces, they leave the food source before pupation. Duration of the pupal period is 714 days at 18-24°C. The adults are grayish brown, with few distinctive markings. The male tends to bear stripes on the thorax and a mid-dorsal stripe on the abdomen, but stripes are usually lacking in females. Flies measure 4-5 mm long. The legs are black and the wings are unmarked but bear dark veins. Adults seek food and moisture soon after emerging, and feed on the flowers of numerous of plants. Fish meal, cottonseed meal, and other materials commonly used as fertilizer are quite attractive to ovipositing adults. The duration of the pre-oviposition period in seedcorn maggot is 714 days. Mated adults live 30-40 days, with longevity increased during cool weather and shortened during the heat of summer. There are some reports that temperatures of 28-30°C are fatal to adults. Egg production is estimated at 100 per female, but this may not reflect field conditions. The biology of seedcorn maggot was given by Reid (1940) and Miles (1948,1952). Methods of rearing were provided by Harris et al. (1966). Techniques to distinguish larvae, pupae, and adults of seedcorn maggot from several related Delia spp. were given by Brooks (1951). An interesting account of Delia ecology, and implications for management from a British perspective, were found in Finch (1989). Damage to seeds and developing embryos may occur before the seedling breaks through the soil. Larvae are able to penetrate seeds as the seed coat splits. Rot often develops as they burrow in the cotyledon. Attack by several maggots may completely inhibit seed germination, but seedlings may suffer only deformity, or recover completely from attack by a single insect. Funderburk and Pedigo (1983), for example, documented that soybean plants were able to compensate for seedcorn maggot damage, and reduction in pod numbers per plant, by increased number of beans per pod. Despite the fact that flies are able to locate emerging seedling readily, and oviposit freely on seedlings, larval performance is superior on freshly planted seeds (Weston and Miller, 1989). Severe damage characteristically occurs during periods of cool and wet weather, when insect activity is favored but plant growth is inhibited. microorganisms secrete attractive volatiles. Brooks (1951) classified this insect as one which normally was present only where more aggressive insects had occurred previously, or where mechanical damage or disease had damaged the plant. Beirne (1971), in reviewing several Canadian studies, also argued that seedcorn maggot was primarily saprophagous. In support of this, Everts et al. (1985) observed that in Colorado, seedcorn maggots were associated with Fusarium-infected onions, and that in choice tests, 78% of eggs were deposited on Fusarium-infected bulbs. Not all microbial organisms are attractive to seedcorn maggots, however, as Harman et al. (1978) found that Chaetomium fungi, which are antagonists of plant pathogenic fungi, inhibit oviposition. Also, Miles (1948) reported that cabbage, cauliflower, and leek grown in England were readily damaged by seed-corn maggot in the absence of disease. Similarly, Nair and McEwen (1973), working with radish in Ontario, concluded that attack by cabbage maggot was not a prerequisite for attack by seedcorn maggot. Seedcorn maggot may also be important in transmission of plant disease. Harrison et al. 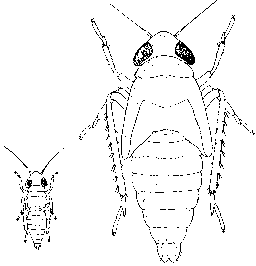 (1980b) summarize data indicating that this insect, and many other species, assist in the overwintering and transmission of bacterial soft rot, Erwinia carotovora. Seedcorn maggot flies are attracted to volatiles given off by microbial organisms associated with decay, and to other volatiles. Cone traps for adult monitoring can be baited with alcohol, odors of fermentation from honey-yeast or molasses solution, or oviposition stimulants such as meat and bonemeal (Reid, 1940; Strong and Apple, 1958; Funderburk et al., 1984a). Enzymatic yeast hydrolyzate also is an attractive bait (Miller and Haarer, 1981). If sticky traps are used, the most attractive color is gray, followed by yellow, white, blue, and other colors (Vernon and Borden, 1983). Finch (1991) reported success with yellow water-pan traps. The use of insecticides for control of seedcorn maggot is similar to onion and cabbage maggot, except that usually it is only the period of plant germination and early growth that is of concern. Therefore, there is less need for long-term protection, and for highly residual insecticides. Nevertheless, residual materials have been used, and insecticide resistance has resulted. Granular in-furrow and over-the-row applications are common. Seed treatment is often adequate. Eckenrode et al. (1973) present a good discussion of chemical treatments. Host-Plant Resistance. Beans with a dark seed coat are less susceptible to injury than white varieties, possibly owing to the hardness of the seed coat and speed of germination (Vea and Eckenrode, 1976; Hagel et al., 1981). Seedling response to injury varies greatly among plants, with cantaloupe and watermelon being severely injured, snap bean and lima bean intermediate, and corn most resistant (Hough-Goldstein and Hess, 1984). Cultural Practices. Cultural practices that normally are considered favorable for crop growth are, unfortunately, also sometimes suitable for seedcorn maggot. There are numerous observations suggesting that freshly tilled soil is attractive to ovipositing seed-corn maggots. Buried crop residues and rotting manure also are attractive, and reduced or no-tillage systems exacerbate fly problems due to the abundance of organic material (Hammond and Stinner, 1987). Egg and larval survival are enhanced when plants are frequently watered. Planting in warm soil, however, favors seedling growth more than it does maggot feeding, so delayed planting is advantageous if it can be timed to avoid the large (usually June) flight. If cover crops or other sources of organic matter are present, it should be disked at least four weeks before planting to allow adequate time for decomposition to occur (Hammond and Cooper, 1993). Anything that promotes rapid seed germination and seedling growth is considered to be beneficial in minimizing injury by seedcorn maggot. Growers can sometime manipulate planting dates and escape the principal flights of seedcorn maggot because there is often a mid-season depression in maggot abundance. Such is the case in Washington, for example, where there are two flights of adults between May 1 and June 15, and lima beans planted after June 1 largely escape attack (Hagel et al., 1981). Screens and row covers are effective protectants against a wide range of insect pests, but they can be ineffective against seedcorn maggot (Hough-Goldstein, 1987; Adams et al., 1990). Because pupae overwinter in the soil, even early spring placement of a covering will not protect against attack; rather, the insects emerge beneath the covering. This is especially true with seed-corn maggot, which feeds freely on manure and rotting plant material as well as a large number of crops. Where can you find delia platura meigen? How long can a delia platura pupae survive buried in the soil?